Yes, you heard it right. Ayala Corps. according to the Philippine Stocks Exchange there are bishops who obtained more than 24,000 shares of Ayala Corp. valued at 8 million several years ago. Not only that, a bishop also received from the Philippine Charity Sweepstakes Office (PCSO) funds for his retirement home ten times the amount given to a PCSO Individual Medical Assistance Program which is P20,000-cap. And lastly, bishops also holds shares in mining firms most especially in Eastern Visayas where the Catholic Bishops Conference of the Philippines (CBCP) was already aware of this huge amount of investments from several bishops. 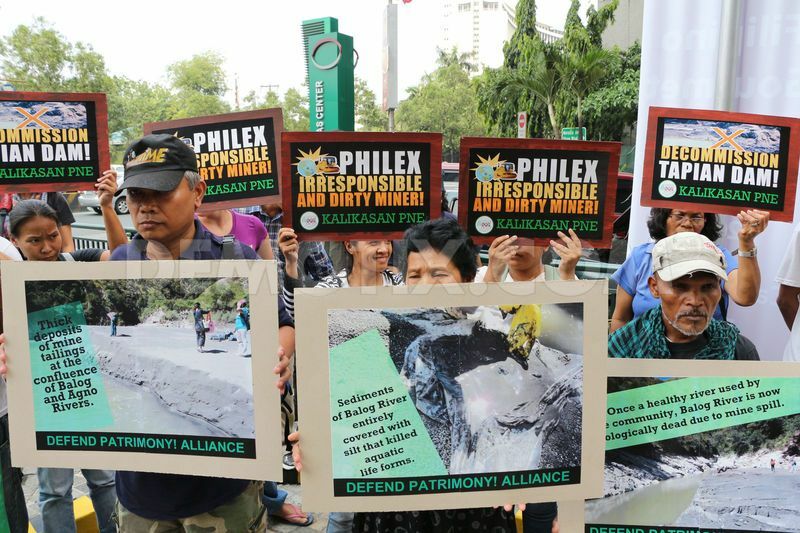 “As shepherds of our flock, it is our collective sentiments that the continuing drive for development of the Eastern Visayas region anchored on mining as well as other extractive economic pursuits, only reinforce the irreversible trend of permanently damaging nature's endowments," according to the CBCP. “As a consequence, the many lines of opportunities upon which our people can draw their life sustenance will definitely be threatened immensely," the CBCP added. In 2009, the retired Tuguegarao Archbishop Diosdado Talamayan asked former President Gloria Macapagal-Arroyo for funds to finish a retirement home in conjunction with his 25th anniversary as a bishop. Talamayan was the one pertained to having a 0.0049 percent of the total shares of the company which ranked him 73rd in the Top 100 stockholders list of Ayala Corp. PSE as the source. According to Talamayan since he was retired he no longer have the control on the retirement home in Solana town. 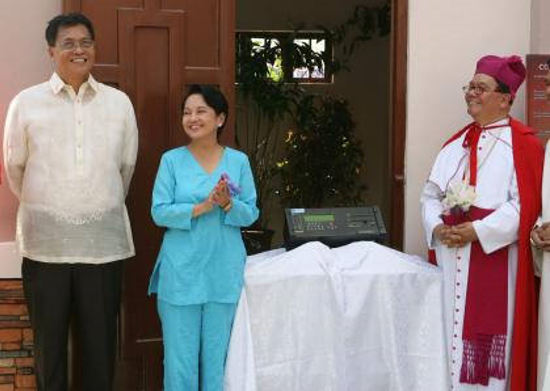 The funds for "operational expenses" in the retirement home was reported coming from the PCSO's public relations fund as requested by Talamayan in celebration of his 25th year as a Catholic bishop. Almost P200,000 was the reported amount given to Talamayan, wherein according to the letter given to PCSO director Ma. Fatima Valde, only P2,500 was the requested amount for the tickets to raise funds in a dinner organized by the diocese. Going back to the letter given to former President GMA, where Talamayan was asking funds for "finishing touches" in the retirement home in Solana town, PCSO board grants the request from the office of the President for the bishops request. The amount was not disclosed on how much was given to Talamayan's request but the board said that the money will be charged to PCSO Charity funds which could have been given as "medical assistance and services and/or charities of national character." Meanwhile, Philippine Stocks Exchange as the source disclosed Archbishops and several bishops in the past who were oppositionists to the mining industry, especially in Eastern Visayas. 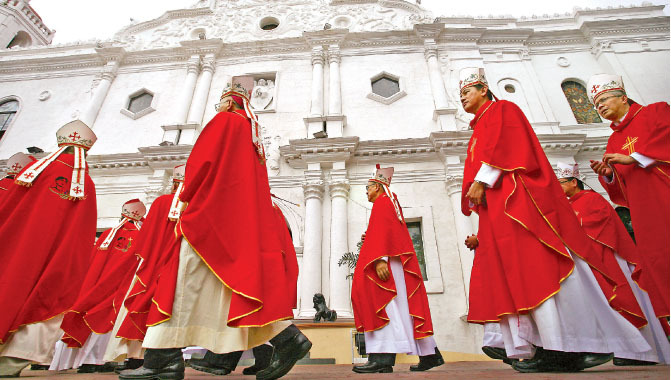 Going back to the stockholders issue from Catholic archdioceses, retired Lingayen-Dagupan Archbishop Oscar Cruz said there's nothing wrong with the Church's investments in local firms, since its wealth was merely inherited from Spanish friars over a century ago and was invested in strong companies to nurture it. PSE data shows that volumes of stocks in companies are shares from the Archdiocese of Tuguegarao. In BPI, the Roman Catholic Archbishop of Manila ranks fourth on the bank's list of Top 100 stockholders with more than 200 million shares currently valued at P17.3 billion, and represent 6.266 percent of the bank’s outstanding shares.